Hakbijl Glass and Flowerfeldt® have a special attention for good business. It means that we are devoted to invest extra time and attention in our partners. Are these only pretty words? No, we do what we say and say what we do. We want to strive to perfection and even more satisfied customers. Just for you. 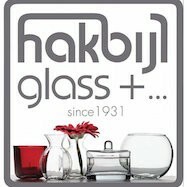 Hakbijl Glass is European market leader in decorative glassware such as vases, pots and plates. Our partner supplies these products in over 80 countries worldwide. Hakbijl Glass introduces more than 500 new products on a yearly basis. That’s one of many reasons why we like to do business with Hakbijl Glass. The only way we can offer you trendy glass products is, when our partners are creative and renew their collections constantly.